Hayley here again with my last page share for February. 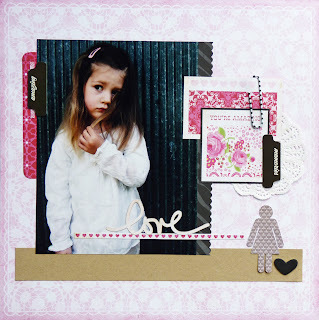 I wanted to share with you this page I did using Lori Whitlock's Love Story Collection. This is quite a simple page but is one of my favourite's. I really liked the My love paper and I knew as soon as I saw it that I would use it for a background. I used a few more cut out pieces from the Snapshots paper, that paper really does go a long way. The title and the little girl shape were both cut on my Cameo. The little tabs are from the Pink Paislee Portfolio collection. I had really been wanting to do this photo for a long time but with the darker background I had been having a bit of a hard time with it. This whole collection lightened it up considerably and I'm so happy that it is done. I actually have a huge page of information I need to include too, so once I get another piece of the background paper I will turn this into a spread and just use up all little bits and pieces to embellish it because it will mostly be journalling. 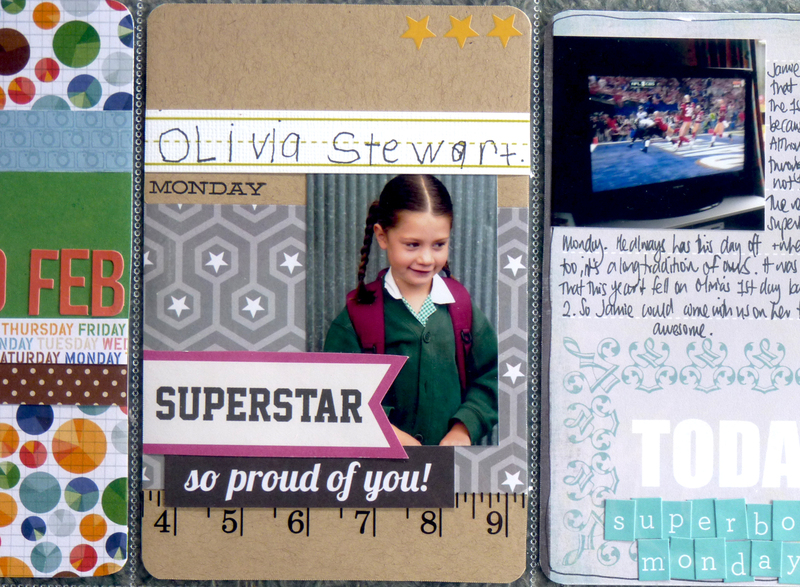 I had a few bits left over from my school pages so I thought I could add them into my project life. These are the two little pockets I made, they feature in different weeks as kindergarten went back before school. This first one is in a 4x4 pocket and I didn't have a photo to go with it so I used the October Afternoon Rubons to create that school book line and I asked Sophia to write her name. I love how she does her S backwards. All of the rubons are from that same sheet, the measuring tape, the apples and the stars on the one below. This one was done in a 4x6 pocket and I did have a photo but I still used similar products. Thanks for stopping by, I've had a lot of fun this month creating valentines and school pages. i love the child written names. Great to have.